A lot of traders close out their positions by the end of the day. 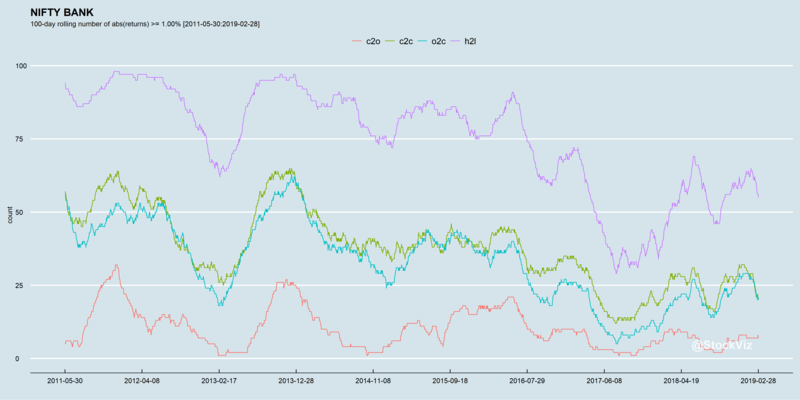 It certainly reduces the risk embedded in overnight moves (c2o) but that has been falling over the years. So has the o2c range. 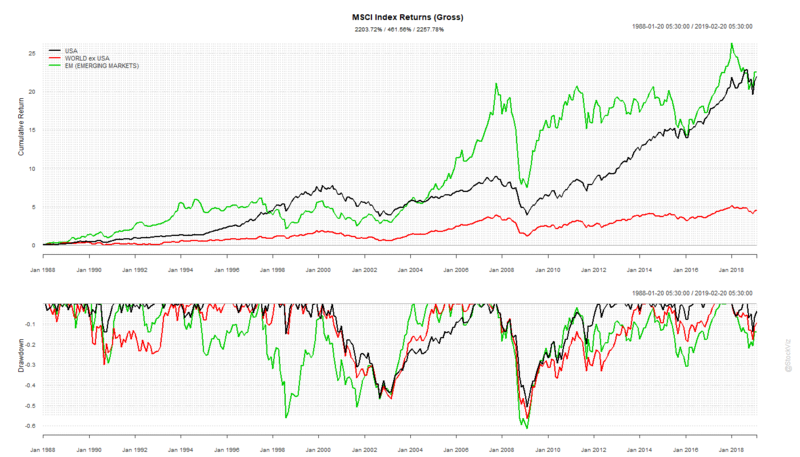 Perhaps it is an artifact of the bull market and reversion to the 2011-2013 range is imminent. Something to keep an eye on. 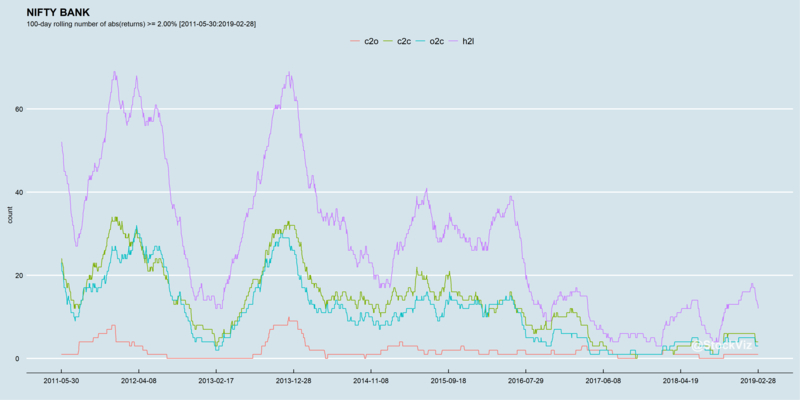 Related: Is the Low Volatility Regime Breaking? Research on hard-currency bonds since Britain and Prussia defeated France at the Battle of Waterloo in 1815 shows that on average the return from lending to governments issuing external debt in sterling or dollars delivered a return close to U.S. stocks, with lower volatility. So, should you ditch your EM equities portfolio and get into EM bonds and US stocks? 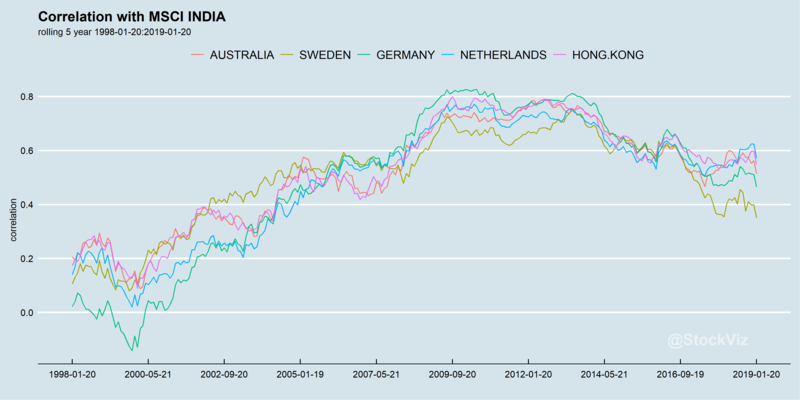 Some analysts could look at a decade of EM equity under-performance, point to its valuation spread vs. US mega-caps, and conclude that EMs are a better place to be for the next decade. While others could point out that the US is the home to most of the world’s biggest tech monopolies so it deserves the out-performance. We will only know who is right once 2030 rolls in. Until then, diversify your portfolio and enjoy your life. 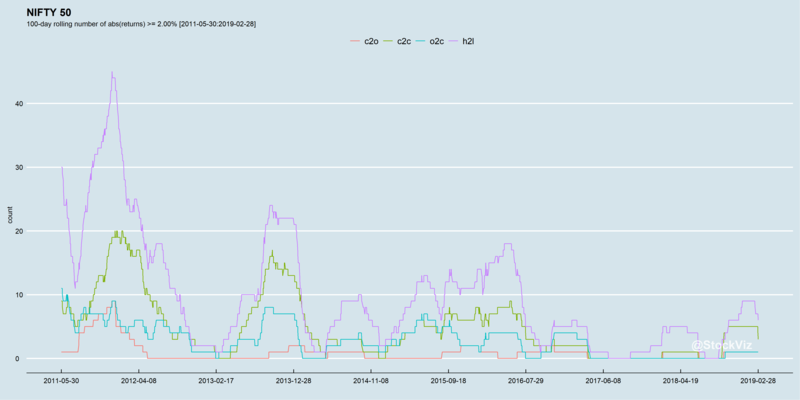 Code and annual return charts are on github. We described a simple dual momentum strategy last month that toggles between equity and bond ETFs. In order to make it easier for you to follow the strategy, we have setup a Slack channel that posts trades triggered by this strategy. 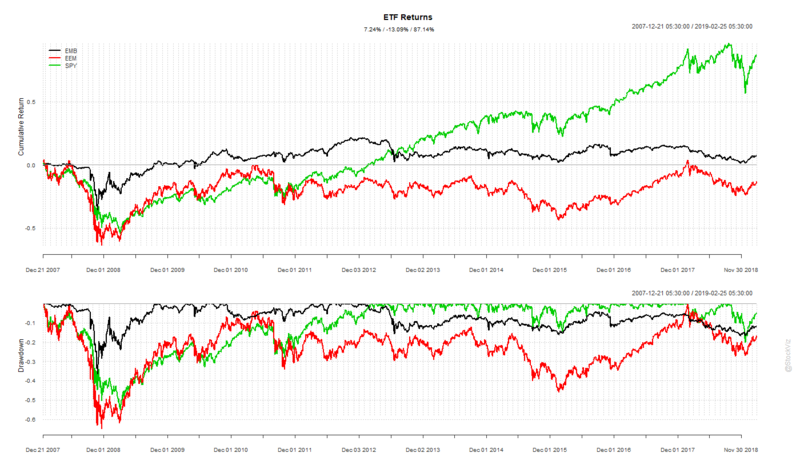 You can also follow the performance of this strategy through two virtual portfolios: Global Equities Momentum I and Global Equities Momentum II. The GEM strategy employs a monthly rebalance schedule. So, at the maximum, expect one SELL and one BUY trade a month. To request an invite to our Slack channel, click here. WhatsApp us if you have any questions! 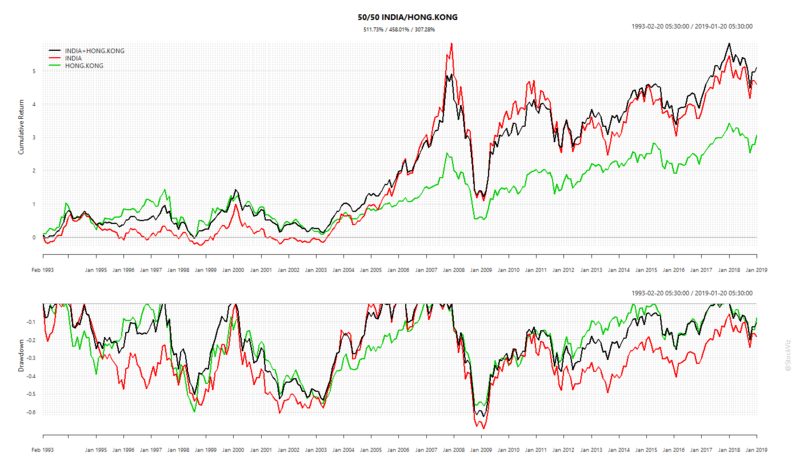 All stocks are correlated to one-another. In times of crisis, these correlations explode higher. The same is true for country indices. 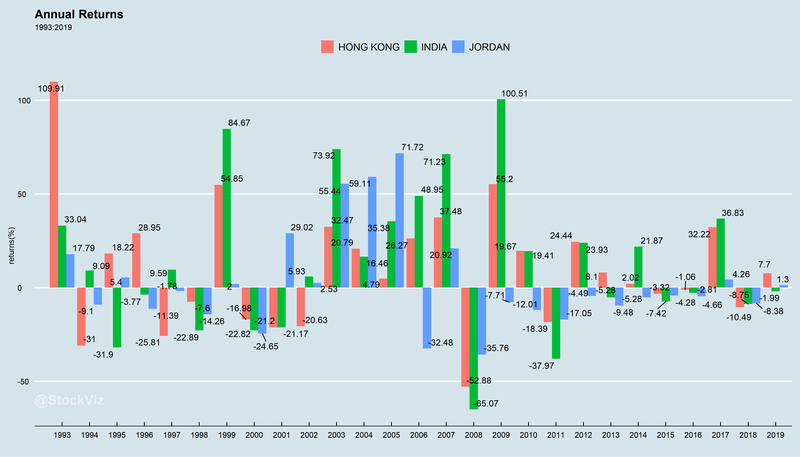 For example, if you look at the rolling 5-year monthly return correlations between the MSCI INDIA index and other country indices, Jordan is the least correlated and Hong Kong is the most correlated. 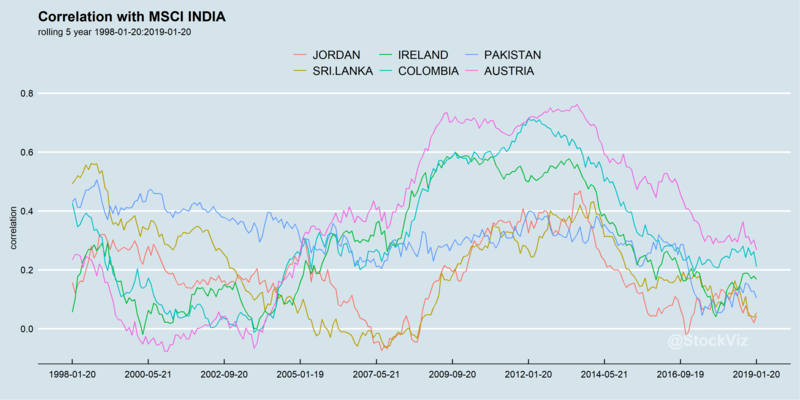 So, does it make sense to construct a 50/50 portfolio between INDIA and JORDAN? 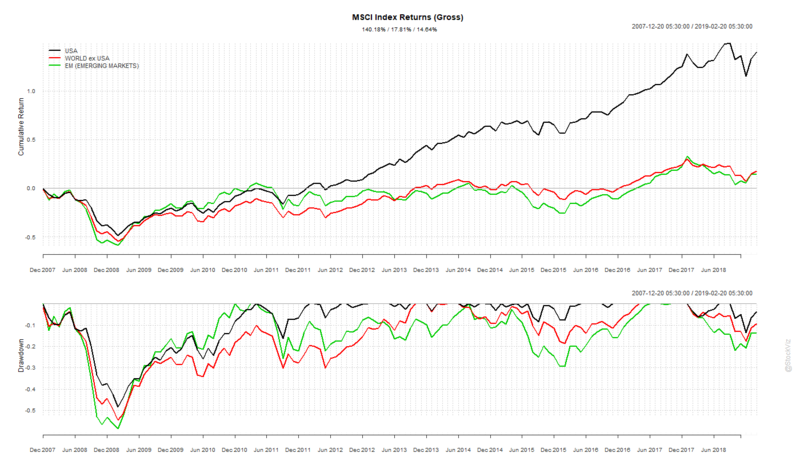 In theory, the resulting portfolio should have lower draw-downs and lesser volatility than either taken alone. A take-away from this is that diversification within the same asset class (in this case equities,) does not help with drawdowns. Nor does it necessarily lead to higher returns. It is way of protecting yourself from mistakes that are only apparent in hindsight. Just ask investors who were invested 100% in Jordan the last decade. 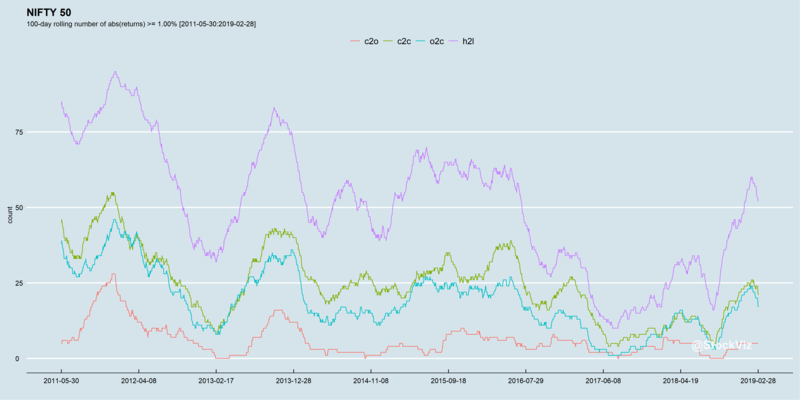 Back in May 2015, we looked at correlations between USDINR and the NIFTY IT index and found that there is no direct relationship between currency moves and subsequent IT index performance in weekly and monthly time-frames. 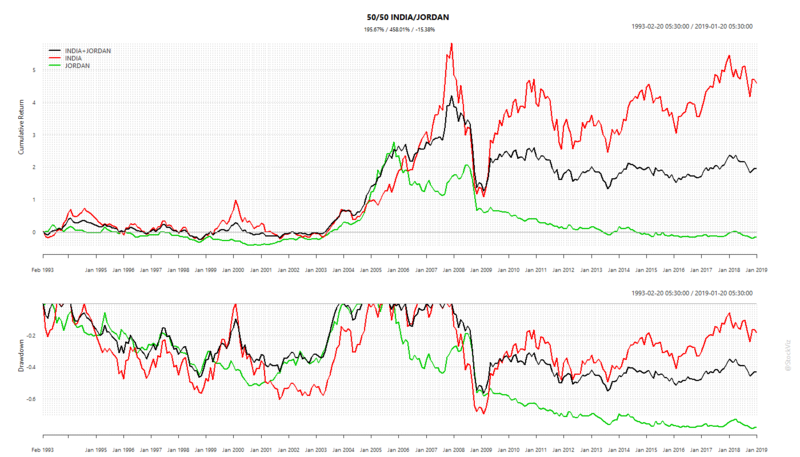 Here are the updated correlation charts.